This post is sponsored by Newell Brands makers of Ball® Jar Fresh Preserving Products; however, all thoughts and opinions are my own. 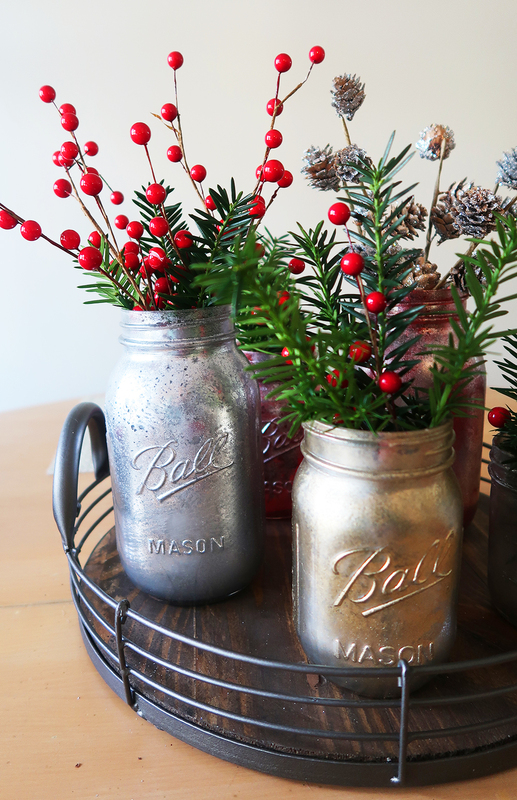 How to make your own DIY mercury glass vases with Ball® Mason Jars. 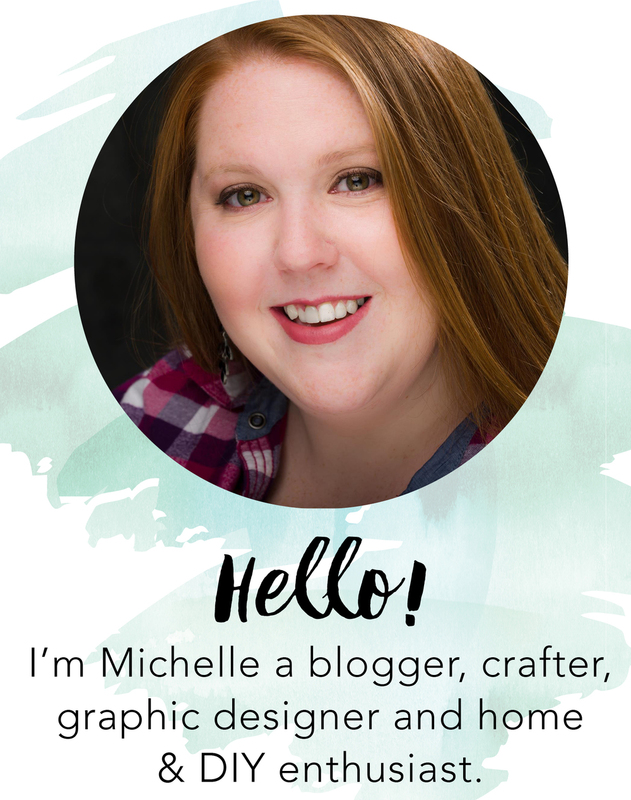 Now you may think it’s a little early for Christmas décor but it is never too early to get a jump start on Christmas especially when you plan on creating handmade décor. What I love about Ball® jars is the possibilities are endless. They are a blank canvas that can stand on their own can become a vase, or a vessel for Christmas cookie mix and even part of a centerpiece. Set up a in a well-ventilated area. 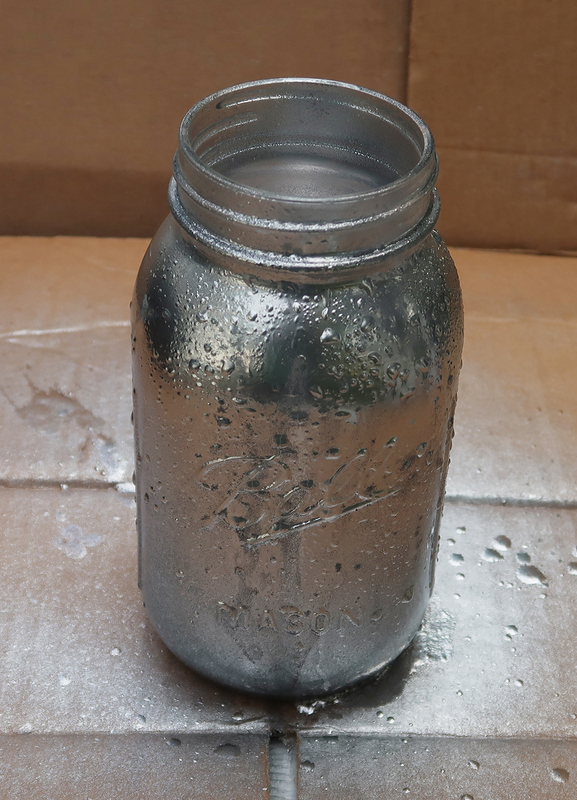 First you want to spray the inside of your Ball® mason jar. Spray lightly and more than one coat to avoid drips. It does not need to be an even coat. In a spray bottle add 50% white vinegar and 50% water. Set your spray bottle to mist. Mist a coat of the vinegar on your mason jar. Shake your spray paint well. 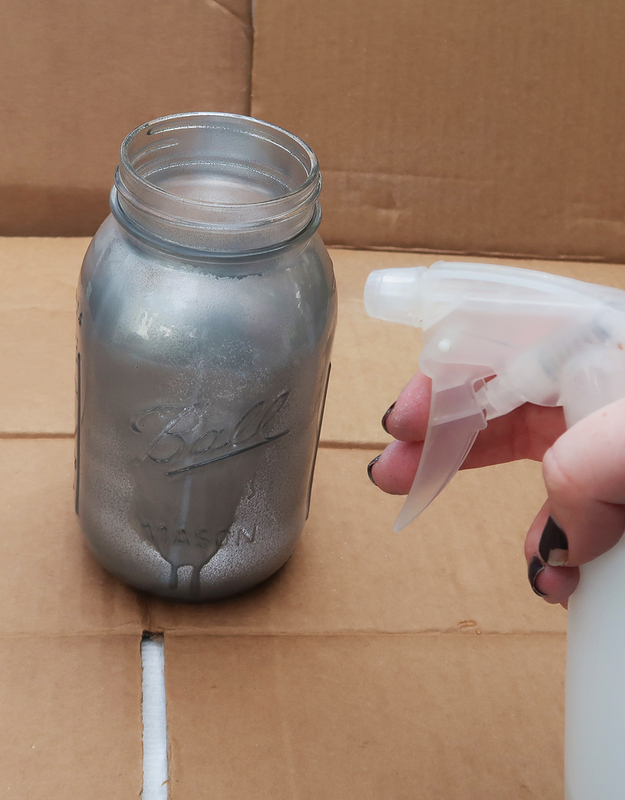 Spray light coats over the beaded vinegar holding the spray paint 6-10 inches from your jar. Wait about 30 seconds using your folded paper towel dab the beaded vinegar mixture off of the mason jar. 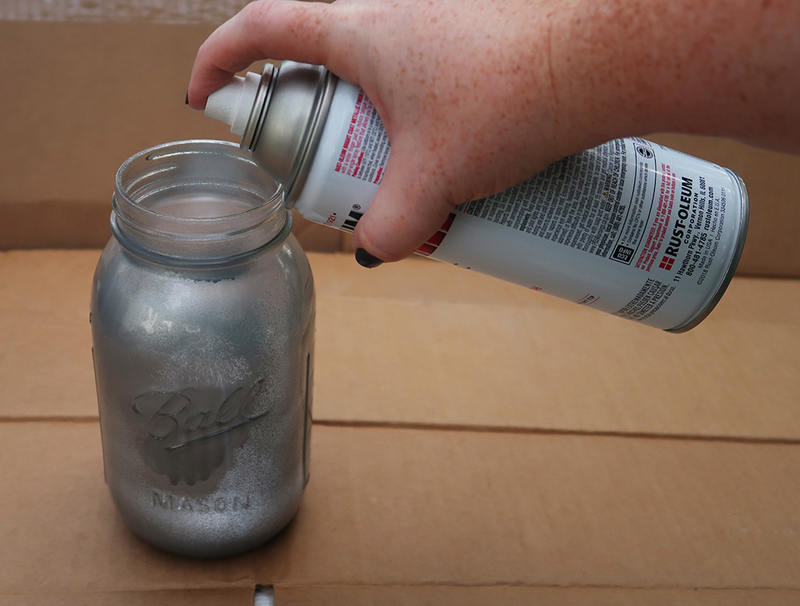 This will leave areas that will show the glass with the metallic spray paint on the inside of the jar. This will give you the mercury glass effect. Repeat step 3 & 4 if needed. 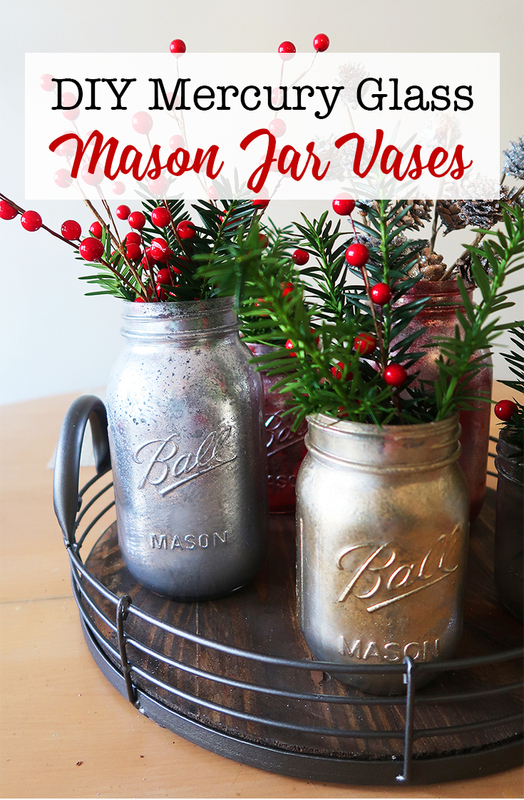 If you are wanting to make a colored mercury glass vase other than silver or gold use that color for the inside of the Ball® Mason Jar and use the gold or silver metallic on the outside. This is how I made the red mercury glass vases below. I also did this with gold and silver for a patina effect. What I love about the holidays is decorating and setting a beautiful table for family and friends. All great tablescapes start with a centerpiece. Because I used 3 different sizes of mason jars the staggering height of the jars make perfect arrangement of vases. I set the mercury glass vases on a round tray to give more depth to the centerpiece. I chose a tray that contrasted my dining table. I used pieces of evergreen, cut fresh from my yard, as well as red berries and mini pine cones dusted with silver glitter. To tie in the table settings to the vases I put a piece or two of the greenery on the napkin as well as a sprig of red berries. You could also use the mercury glass Ball® mason jars to hold cutlery if you were having more of a buffet style meal. 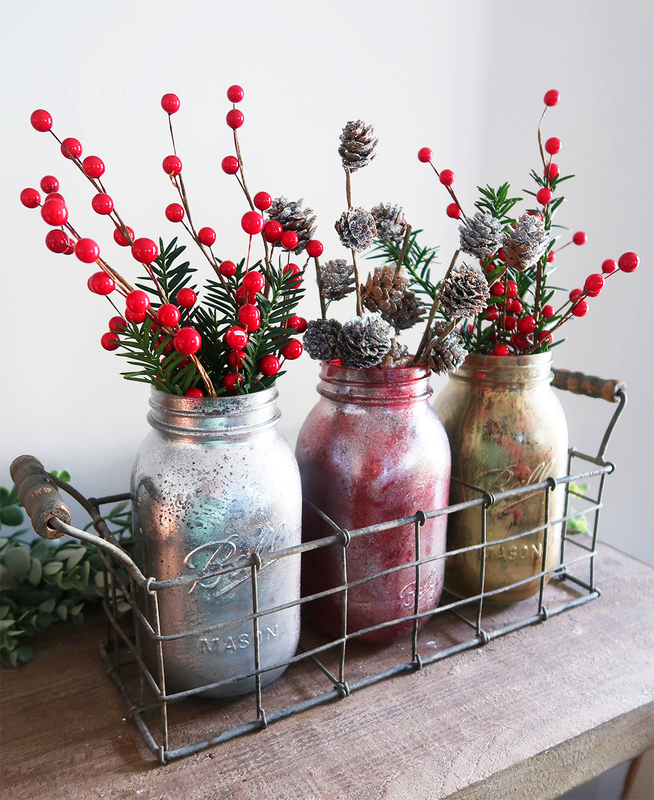 If you aren’t having Christmas dinner or a holiday party these mercury glasses vases will add a bit of festiveness to any room or shelf. I simply put 3 of the mason jars into this antique holder but they would also look great on a tray or simply on their own. Check out the whole Christmas tablescape here.